In 1900, Kushtia belonged to Jessor District and ruled by Maharaja Pramath Vushan Debroy. 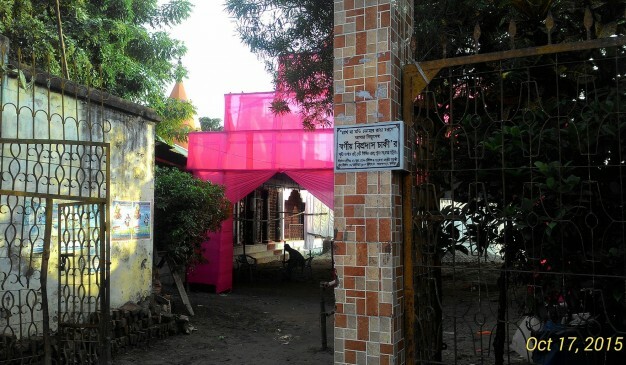 He donated a land on where local business people built the Gopinath Jiu Temple. The Rath-yatra and Mela (fair) started to occur from 1905 in memory of the beloved wife of Maharaja Devroy. 7 years after that, a local rich businessman named Makhan Roy funded to made a large Rath (Replica of Mythical vehicle) made out of Brass. At that time, this was the only and largest Metal made Rath among the whole Indian subcontinent. The Rath is still placed inside the Temple and many people come here to visit the historical Rath. In 2015, a renovation work of the temple began. From Kushtia Mojompur Bus Stand, you need to go to the NS Road by an auto-rickshaw. It costs only 5 taka. The Temple is situated on NS Road. Put off your shoes when you get enter into any Hindu Religious Place. NS Road is the place where all the standard hotel and restaurants are situated in Kushtia city. You will see a lot of restaurants because it is the market area. 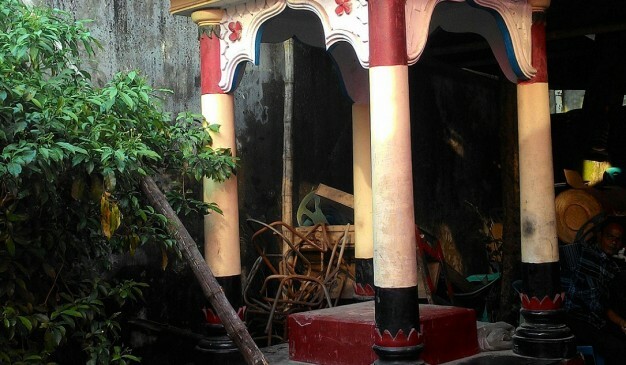 The 300-year old Teota Zamindar Palace (তেওতা জমিদার বাড়ী) at the village Teota under Shibalaya Upazila in Manikganj District still stands with pride & dignity becoming a living testimony to the history of that time. Travelers and explorers can't resist the temptation of having a look at the captivating old palace when they pass through the area. 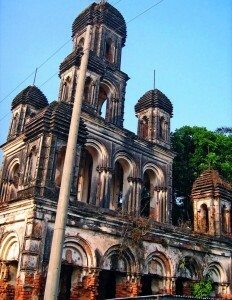 There is a temple just adjacent to this old palace named 'Nava-Ratna Temple' (নব-রত্ন মন্দির). For the readers concern, it is to inform that there are very few 'Nava-Ratna' Temples in Bengal. According to the stone inscription found in Nava-Ratna Temple inside of the Teota Palace, this palace was constructed during the years between 1702 to 1703. As per this account, the age of the building is more than 300 years. Hemshangkar Estate consists of the buildings located on the north side of the main buildings of Teota Zamindar Palace and establishments on the southern side of Zamindar Palace form Joyshangkar Estate. There is a hidden chamber called ‘black pit’ in the underground of the southern building. Four storied Nava-Ratna Temple stands in front of the south building. It is 75 feet high. There are four more temples near the south building. The Zaminder Palace in Teota is established on 7.38 acres of land. Some portions of the building have collapsed. The navaratna style of temple architecture (Sanskrit: नवरत्न, meaning "nine gems") incorporates two main levels, each with four spired corner pavilions, and a central pavilion above, for a total of nine spires. 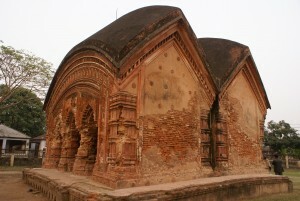 The style arose in Bengal during the eighteenth century as an elaboration of the pancharatna (পঞ্চ রত্ন) style that had five pavilions (four at the corners and one above). Kodla Math Temple was built by a Brahman in the 17th century, but is not standing the test of time very well. It's near a village named Ayodhya, about 10 km or so north of Bagerhat. This is a Hindu Moth (though it doesn't look like a regular Hindu temple) locally known as Kodla Moth as it is located at the village Kodola. It has another name, which is Ojodhdhar Moth. May be the correct spelling can be Ayodhyar Moth. It is a tall structure that has a square shaped base. Approximate height of the Moth is slightly above the 18 meters. It has three gates at the three sides. Outer wall is totally covered with the burnt soils (or bricks) and designed as horizontal parallel lines. Each of such horizontal lines are having a foot distance in between and those are found from top to the bottom of the structure. I have found 2/3 very small terracotta on the outer side of the walls. One was probably a shape of an elephant. It is totally unknown these days about the builder of this Moth. It had a nearly destroyed inscription around it whose meaning is still unsolved these days. Scholar people are guessing this as an edifice of 16th or 17th century. 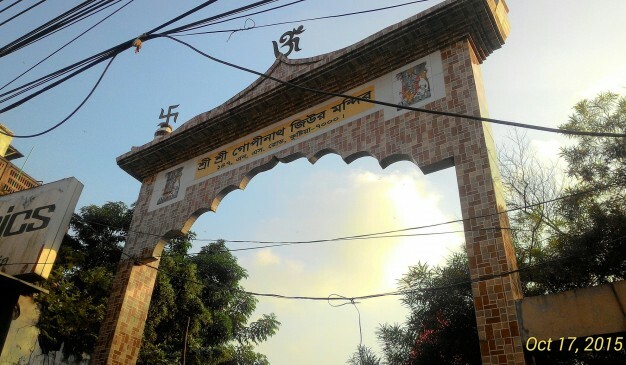 Ghoshal Bari Radha Krishna Temple, About 100 years old (now rebuilt) Radha-Krisna temple with its outstanding view standing at Atpara village. 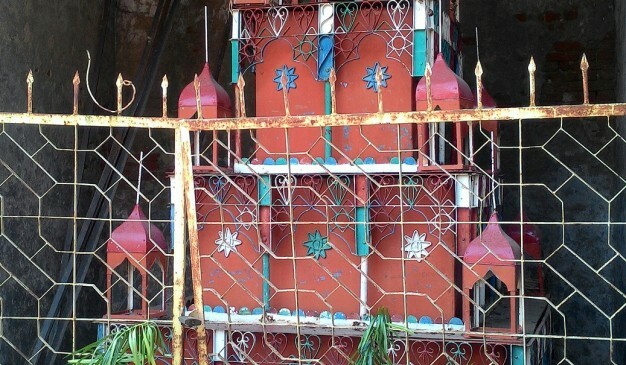 The temple is situated at Atpara under Vajrayoguni Union Parisad of Munshiganj district by the road side leading to Tangibari at a distance of 7.2 km from Munshiganj town. Adjacent to this temple there are two more temples which appear to have been erected recently. 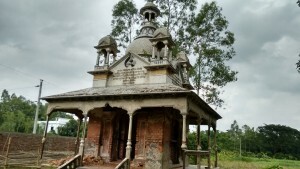 It is a ‘Pancha ratna’ temple resting on a square sanctum. Its south-east corner ratna along with large portion of the body is missing. The four turrets are set on the roof top corners while the large fifth central sikhara rises above them the wall of the temple is 63 cm thick. The temple has sharply curved cornices and an arched entrance on the south but its lower portion is in a dilapidated condition. The char Chala central ratna rests upon its rectangular base which has an arched entrance and panel decoration. The south and other sides are relieved with imitation doorway design and paneled bands. The central tapering tower rises above and terminates in an iron shike. 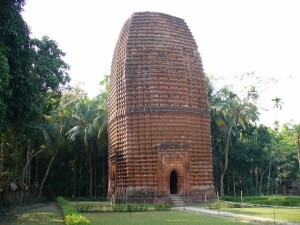 The four miniature corner turrets are similar to the central one and have four openings each.This variety is the most popular type of temples that flourished in Bengal in the 19th century A.D.